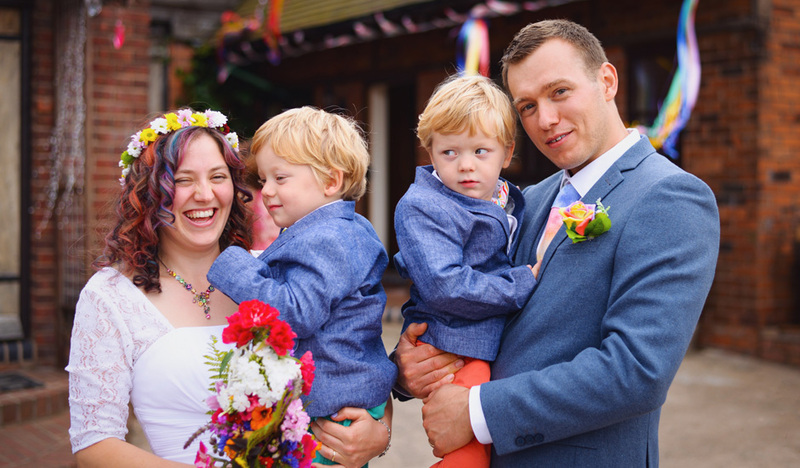 Supporters Joe and Anna recently celebrated their wedding with a rainbow theme, raising over £1,000 for Rainbow Trust during their special day. Composers Joe and Anna write and produce pieces of music to be used in advertising. They chose Rainbow Trust to benefit from donations in lieu of presents after Anna had a tough time when she was expecting their twins, Ben and Nathan. She and Joe were given all sorts of worrying information during the pregnancy, but happily they were born safely and with no complications. Ben and Nathan are now healthy, lively three year olds, so when the couple set a wedding date they knew they wanted to help families less fortunate than theirs. “We’re so glad we’ve been able to raise the amount we did for Rainbow Trust and hope to raise more, by donating proceeds of the sales of a piece of music we’ve written. If you are considering including Rainbow Trust in your celebration, visit our Big Day page, where there are decorations and place cards available to download. You can also request balloons and personalised donation envelopes to help you organise your special day.